It is undeniable that the new U.S. president in the person of Donald Trump has become a hot media item. Since he declared his candidacy up to the campaign period, he has attracted international attention not only from the public but as well as from the various media outlets covering his story. Unfortunately, Trump’s presidency has been tainted with numerous fake news resulting in a war against the press. Fake news is often associated with trolling and lies. Trolling originally refers to certain websites that publish made-up news stories while a lie is equivalent to deception wherein someone committed a wrongdoing. So when it comes to Trump, what really is fake news? And is the new American President correct when he says that certain news about him is fake? Take the case of the recent polls that showed a negative approval rating for Trump at 44 percent. 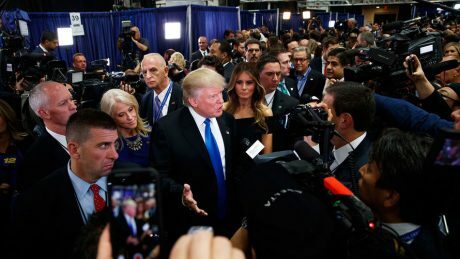 CNN (Cable News Network) recently conducted a survey showing the worst early approval rating for any U.S. President in history and this led Trump to lash out at the polls saying any negative survey results are fake news and even identified several major news networks such as CNN, ABC and NBC. He further accused the media of spreading lies about him. Gallup also conducted a survey and recorded a similar result. The group which has done polls for every U.S. president since Dwight Eisenhower even noted a lower approval rating for Trump at 42 percent in just two weeks into office. This rating was much lower than what Barack Obama achieved (76 percent) after his first 14 days in office. Obama’s 76 percent was considered the highest for any recent president. With regards to the new policies has has implemented so far, 53 percent objected to Trump’s executive order temporarily banning travel to the U.S. of citizens from seven Muslim countries including Syria. More than half (55 percent) also viewed the order as an attempt to prohibit Muslims from entering the US adding that the act only makes the U.S. less safer from terrorism. In addition, 60 percent did not like his plan to build a wall along the US-Mexico border. Amidst this war between Trump and the media, there are technologies in place to help people decipher whether news about Trump is fake or not. Specifically, they can check facts in an automated manner. ClaimBuster utilizes natural language processing (NLP) techniques to verity if claims are factual within a text. This Australian project is not capable of checking facts automatically but it can point out statements that need to be checked. Wikidata, on the other hand, is an open knowledgebase that offers a structured data. A project of Wikimedia Foundation, it can be used free of charge by anybody and the information can be edited as well. Its main objective is to provide a common data source with focus on various topics or items. Wolfram/Alpha is both a search and answer engine that features a large database that stores curated facts and knowledge from across the globe. It is capable of calculating answers on a wide range of topics. Users can search the database with so-called natural language questions. Full Fact can also help you check facts and get results delivered straight to your inbox. This automated fact checking tool was developed by a non-profit organization based in the U.K. The charity group is on a mission to push for corrections where needed and work with government departments and research institutions to improve quality of information. With these useful online tools in place, people can now fact check news about Trump that they find not very accurate. U.S. President Donald Trump has been reported to be spreading fake news since he started his campaign for the presidency. An analysis report said he succeeded in using false claims to attack his political adversaries and the media as well as question the loyalty of the Obama administration and other Democrats. Many of his fraudulent claims involved news published on websites and social networking sites such as YouTube and Twitter and analysts have found that the information that backed up those claims were from unreliable sources.